I love burning candles. I love the flicker of the flame. I actually like to SEE the flame. I have not been impressed with the electronic candles. The “flames” “flicker” was not very good. I had purchased tea lights but I don’t think I have used them but once because they don’t really give me the atmosphere of a real candle. Then there are the ones, I’ve seen them mostly as pillars, where you don’t even see any type of fake flame. It is just a glow within the “wax”/candle. Those are even less of what I want when I light a candle. For my birthday I received a large set of electronic candles. I looked at them and thought, “Hmmm. I don’t really like electronic candles.” But I took them out of the box to give them a try. Usually I keep the box for everything, but this one I put in the recycle right away and I am wishing I would have kept it. At least I have the instruction booklet. I like these ones. 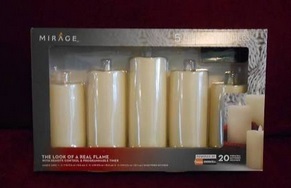 The candles I received are Mirage electronic candles. Since I threw my box away this is a picture from the internet. These electronic candles have a fake “flame” on the top of each pillar. It is just plastic in the “shape” of a flame. But there is a little bobble in the candle that moves and it makes the light flicker. To me it is much more like a real flame. Plus, the little bobble make a noise and while it is not exactly like the noise from a flame it reminds me of it. Also these are controlled by a remote control. So instead of me having to pick up each candle and flip a switch on the bottom to turn them on and off, I just press a button. They don’t always ALL go on at once, but that is ok, I just keep pressing the button until the go on. The same with off. 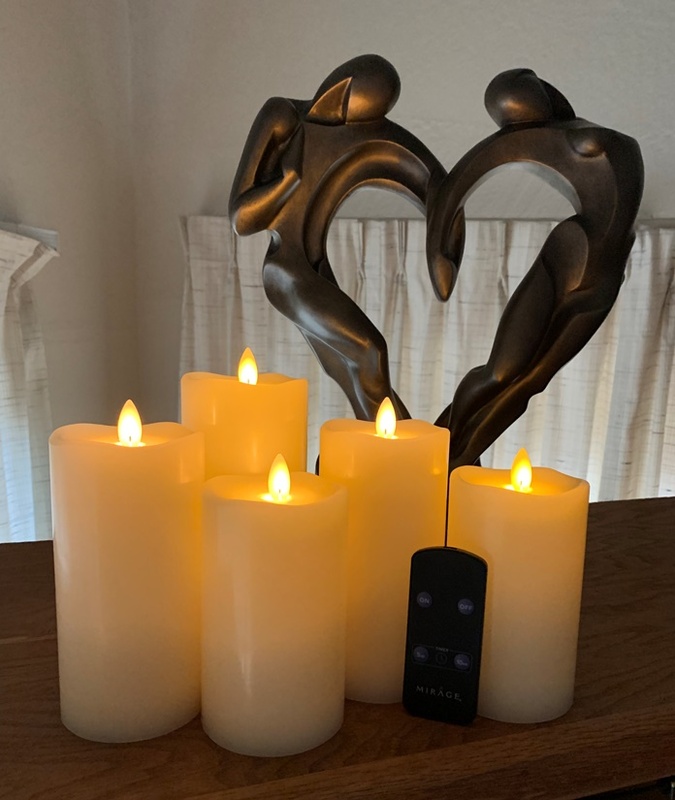 They also have a programmable timer which I didn’t pay attention to the first time I used them and my husband said, “Your candles are broken. I came in and they were on in the middle of the night.” They can be programmed to turn on every day at the same time. That happened the first couple of times actually, because I had activated the timer using the button on the bottom of the candle. There is also just a timer on the remote control where you can turn the candles on for 5 hours or 10 hours. The one issue I have with them is the fact that each candle takes four double A batteries. That just seems like a lot to me, but . . . . the batteries came in the box with the candles, so that is nice. And we have been using them pretty consistently for about two and half months and they are still working. I realize these might not be new to some since they have probably been around for some time . . . but I like to share things that I think are cool even if I am “late to the party”. I was thinking the these might be a great Christmas gift. As I consider them a great birthday gift that I received. I love burning candles, but when it is hot I don’t like to have the flame add to the heat in the house. And I had not liked any of the electronic candles I had seen before. So I am really enjoying these candles. Since it is winter we turn them on PLUS light a real candle so we have a lot of hygge. But with these candles we can have a sense of hygge in the summer, too! Do you like electronic candles? Do you have any?